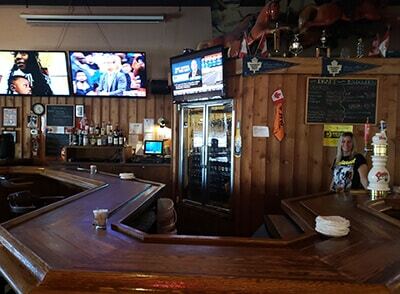 Proprietor Tom Markos, who has owned RickiJo’s since 1987, has made some big changes in the interior decor of the establishment in the last several years, adding to the comforts and conveniences and generally making things better for customers. The bigger, more numerous screens for the football crowd are just part of the thoughtfulness that has gone into all these changes. But no matter how attractive a place, of course, it’s the food and the friendliness that counts and RickiJo’s has earned a reputation for excellence in both areas. Click to download our menu! 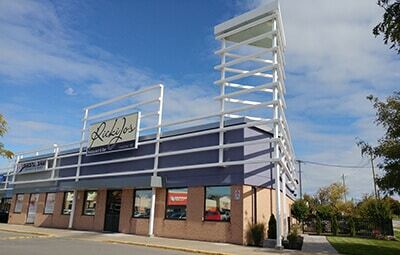 The steady growth in customers is also because Tom stays aware of the current popular taste in foods as well as retaining the traditional homestyle dining that attracts so many families and older people to RickiJo’s. Tom and his staff keep tabs on what people are enjoying, what they’re asking for and who’s eating what. They respond by introducing specials, which are then placed on the menu if they prove to be popular. Last year, for instance, wraps were introduced. Today, they are big sellers and they’re on the menu. Roast Beef has its followers on Saturday and Sundays. Nothing is written in stone, however. As contemporary tastes in food change, RickiJo’s makes sure they keep pace with popular demand. RickiJo’s homemade soups and sauces, the quality of their food, the choices of entrees and the specials each day brings have all contributed to making this one of the most popular dining establishments in town. 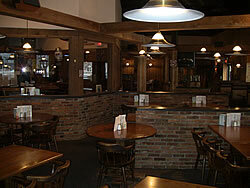 It’s also a cheery, fun place to meet your friends for a drink or have a meal. Wait staff makes a point of ensuring you’re comfortable and is only too delighted to let you know what’s great that day and what’s really great. (So far, they’ve not been wrong!) The fact that very large portions are served (great for doggy bag lunches the next day), at prices that are extremely reasonable, have added to the appeal. Every Wednesday is Seniors Day, they can dine at a 15% discount between 4 p.m. and 10:00 p.m., from a special menu and receive No PST or GST off the food menu. There are great dinner specials all week including specials on Wings, regular and breaded, Garlic Bread and Steak just to name a few. If you’re taking a large group of people with you to celebrate some event or a special day, better make a reservation. 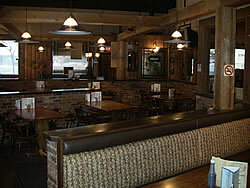 RickiJo’s can accommodate large groups with advanced notice.